2014 has been absolutely mammoth for me because I finally got myself a job in the beer industry, at Redwell Brewery in Norwich. I've been drinking Redwell beers since the beginning and I've known everyone involved since way before it started so I was so happy when they offered me a job. Basically what I'm doing is covering all aspects of social media, marketing, promotions, events, beer festivals amongst other things. I've been here about a week and a half now, and it's just awesome! I'm so happy to be working in an industry that I love, with some really awesome people who I call friends. Anyway, I do Golden Pints every year and it's always so difficult because I drink a ridiculous amount of beer. Probably too many beers. I'll give it a crack, though, as always. Best UK Cask Beer: Oakham Citra (again) - Seriously, I have no reason to choose any other cask beer. This is probably because these days, I don't drink enough of them and when I do it's almost always Citra. Best UK Keg Beer: Magic Rock Cannonball - Realistically, if this is on in a pub I am going to order it. No question. Best UK Bottled or Canned Beer: This is a toss up between Beavertown Gamma Ray (can) & Fourpure IPA (can) - Both are incredibly juicy and delicious. Best Overseas Draught Beer: Tbh, I'm gonna go with Lagunitas IPA again. It's just brilliant, widely available and reasonably priced. I can't get enough of it. Best Overseas Bottled or Canned Beer: Three Floyds Zombie Dust. I bought a few bottles from Mikkeller's webshop earlier this year. I require more. Best Collaboration Brew: Adnams/Sixpoint Make It Rain - An American IPA brewed exclusively for Wetherspoons and incredible. It rained down my throat many times. Best Overall Beer: It's gotta be Three Floyds Zombie Dust. GIVE ME MORE. Best Branding, Pumpclip or Label: Love Weird Beard's branding because I could never grow a beard as weird as the ones on the labels. Best UK Brewery: Beavertown. They just do everything right. Best Overseas Brewery: Sierra Nevada - they manage to get every style they do right and their Kellerweis has made me especially happy. Best New Brewery Opening 2014: Was Fourpure first opened this year? Probably not but that's when I discovered them and I love them. Pub/Bar of the Year: The Swan in Stratford St Mary's. I went twice this year, first on The Craft Wanker Day Trip and secondly for dinner on a trip away. Everything about this pub is amazing. 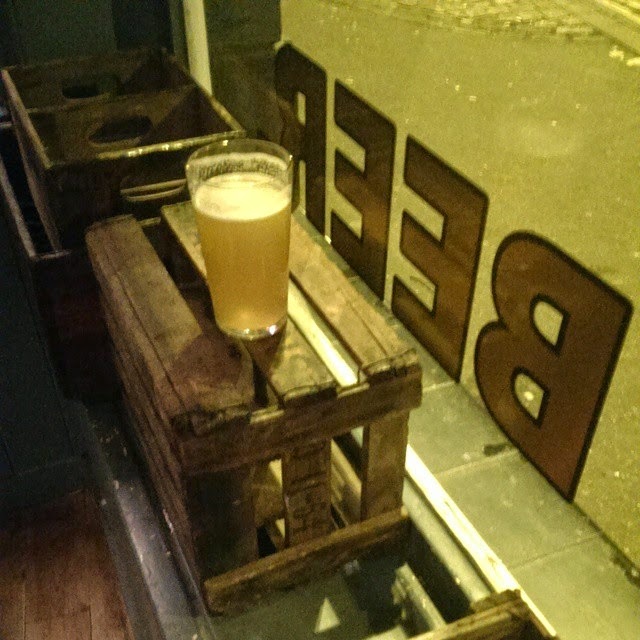 Best New Pub/Bar Opening 2014: The Mash Tun, Norwich. 15 keg lines, a hop infuser, 4 handpumps, loads of great spirits and Harbercue cooking American inspired smoked meats. Not to mention the soon-to-open Gin Palace upstairs which will have over 150 gins and infusions! Beer Festival of the Year: London Craft Beer Festival was great... it allowed me to try so many beers that I otherwise wouldn't have had access to. Supermarket of the Year: Waitrose - I don't get there often but when I do I'm always impressed by the selection. Independent Retailer of the Year: Harper Wells, Norwich. Although predominantly a wine shop, Brian (with the help of Redwell's distribution arm) has turned it into the number one place to buy bottled and canned craft beer in Norwich. Online Retailer of the Year: Ales By Mail - I think I've used them more than any other online retailer this year. Best Beer Book or Magazine: Although not 100% beer, I really enjoyed The Enlightened Imbibers Guide to Alcohol by The Thinking Drinkers. Best Beer App: Untappd, obviously. How else would I know what I've drunk before? 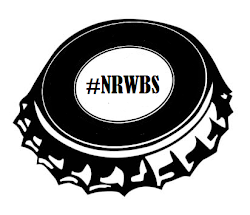 Simon Johnson Award for Best Beer Twitterer: Without a doubt it's Michael McGrorty. If we lived closer we'd be the best mates ever and hang out all the time. Best Brewery Website/Social media: Redwell because I'm their social media guy and I'm awesome. Food and Beer Pairing of the Year: De Dolle Oerbier with Game Pudding at The Swan. Alright, I haven't kept up with my advent calendar because I've had other things to do, but it's cool. I imagine I'll get back on it soon... rest assured that I've still been drinking all the beer! Anyway, last Friday manager of Ten Bells in Norwich, Richard, invited me and a guest along to sample Bullitt's new menu along with the winter cocktail menu. We arrived at 7:30pm and were shown to our table by Richard who left us to peruse the cocktail & food menus. After a while another member of staff came over to take our first cocktail orders - I went for a Cold Buttered Rum which was incredible - it was so smooth with the rum and spices coming through perfectly. My guest went for something a little different - I forget what it's called but it was marvellously sour and bitter with a little sweetness. Our food orders were taken - I got Pork on Pork while my guest got the only suitable option for her as she doesn't eat meat, Taiwanese style hirata buns with pickled ginger, Asian style slaw and marinated salmon. Both came with fries, mine were hilariously massive King Chips whilst My guest's came with sweet potato fries. 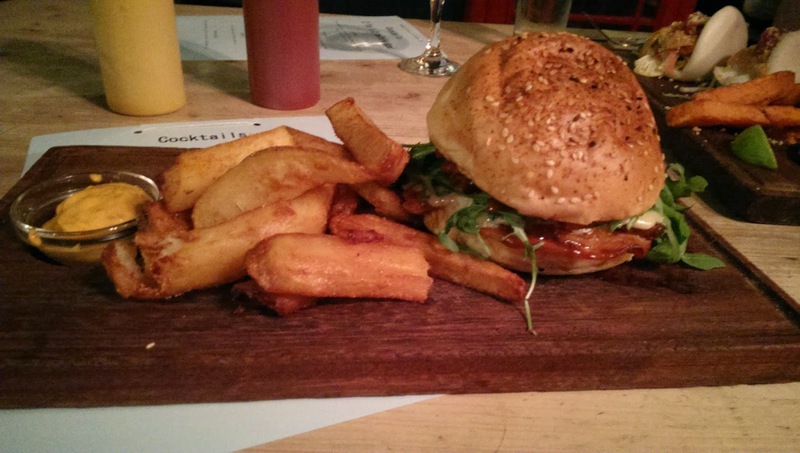 My pork on pork was really something special - both hot & cold pork with mint & chorizo jam in a homemade bun. As I took my first bite I was in awe - the pork was perfectly tender with the cold & hot pork complimenting each other, a little spice coming in from the chorizo with a cooling mint finish. I will eat it again, for sure! My guest's steamed buns with salmon was damn good too... 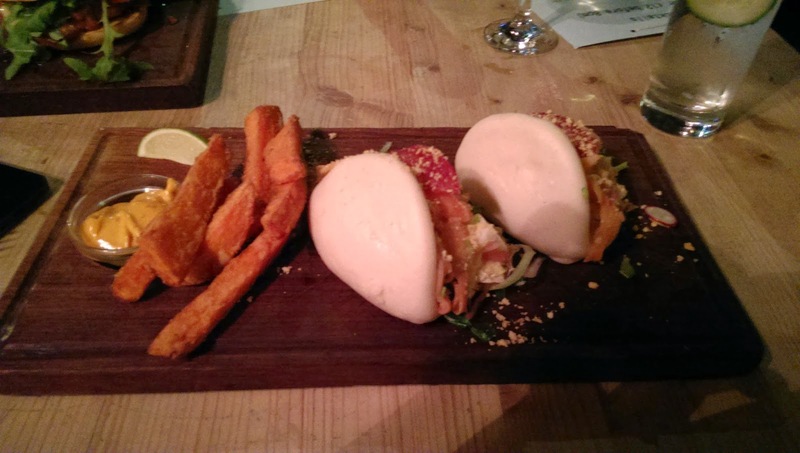 I'd never had a steamed bun before but I will be having them again! The salmon was really nice and done differently to what I've had before with the slaw giving it a nice kick! We had a few more cocktails including the Black Jack & The Chaplin Revue which as always were outstanding. All in all, we had an awesome evening and will definitely be returning! Thanks to Richard at Ten Bells & Bullitt for the free food and cocktails! You can get cocktails at Ten Bells every day but Bullitt are only there Friday - Sunday... GO ASAP! As I've mentioned before, Adnams are one of my favourite British breweries. They may be fairly traditional with Southwold Bitter and Broadside, but head brewer Fergus proves that he can use lashings of hops and brew new world style beers time and time again. To be honest though, i rarely buy their bottled or canned beers (other than Ghost Ship) because here in Norwich I'm guaranteed to find their beers on cask and keg everywhere. Wild Hop Amber Beer is a very awesome idea. What Adnams did was put feelers out into the internet to essentially crowd source wild hops, as well as ones that people had been growing in their gardens. Due to this, it's rather interesting as the hops used are basically unspecified - they could be any variety and mixture of British hops. Look: Pours a dark amber with a fizzy white head that disappears quickly. Aroma: On the nose you get grassiness, and citrus bitterness with a bit of toasted brown bread in the malt. Flavour: Light bready grains, a bit floral, lashings of citrus, candied orange peel, a peppery spiciness and a long, lasting bitterness. Mouthfeel: Sharp and prickly, but gets smoother as it goes down. Overall: It's an interestingly delicious beer - due to the different types of hops used, you get so many different qualities. I'd highly recommend buying a bottle or two, especially if you're a hop freak. "I don't like lager. I only really drink ale but this is awesome" says Jim as he slams his empty glass that used to contain Redwell Hells Lager on the table. This is why I do the beer thing, for reactions like this. I introduce people to beers they wouldn't usually drink. 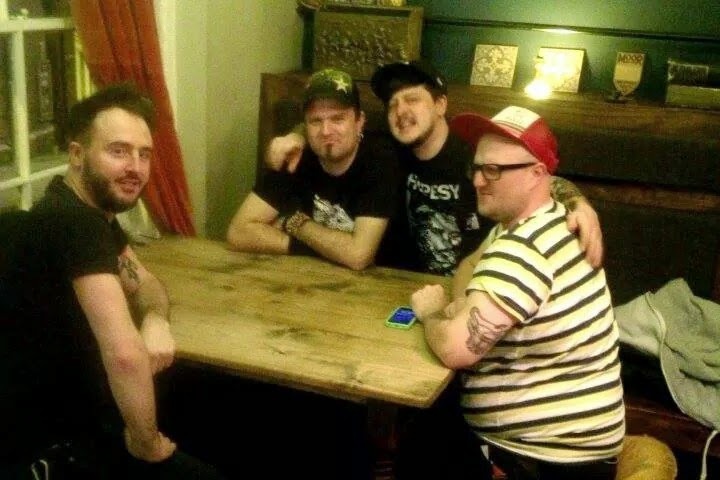 Last night I had the pleasure of meeting up with British Heavy Metal band Raging Speedhorn before the first night of their first UK tour in 6 years, at Norwich Waterfront. You'll know from my history that I don't do regular band interviews. They're boring. The guys from Raging Speedhorn agree "Why have you reformed? Who are your influences?" Jay tells me they get asked all of the time. So I took the guys to Norwich Taphouse and figured I'd introduce them to our beers from Redwell Brewery, just to put an awesome spin on things. 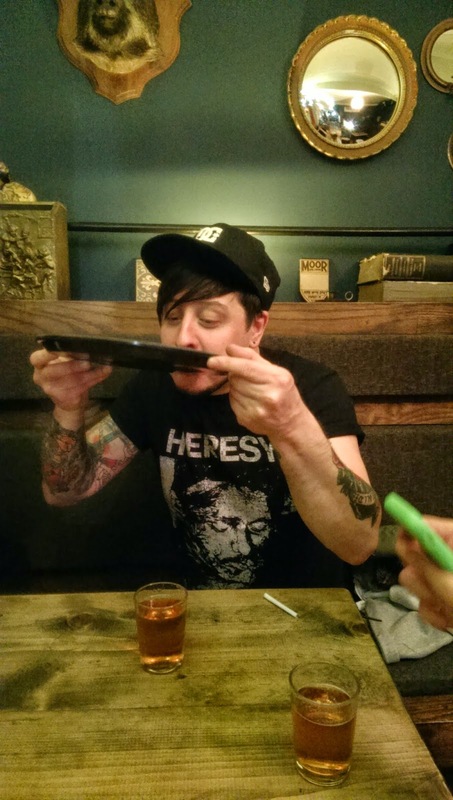 We started off with Hells, which was loved all around the table. Guys, like Jim, who don't drink lager, loved it. They say they could drink pint after pint of it, I agree. Its lemony fresh crispness makes it amazing. Redwell Pale Ale came next and again, it was a winner with everyone despite the fact that they also generally don't drink really hoppy beers. "This is really clean and doesn't have the bitterness that a lot of hoppy beers usually have" remarks Gordon. Thirds of Pale were sunk in double time whilst generally chatting about beer and stuff. Redwell Steam, my favourite came next, and everyone enjoyed it but it wasn't their favourite. If only we had time for more beers, but we had to head back to the venue as it was getting late and they had a gig to play! The gig was good. I enjoyed the support band, Sworn to Oath, they were heavy and really rather brutal but Raging Speedhorn was the winner of the night. They're a band I used to listen to back in the day but I never had the chance to see them live when I was younger. I'm glad the sound issues have been sorted out in The Waterfront Studio - it was great, despite the smaller stage and room (and poor quality beer). They played a lot of the music I know and remember, as well as a new track (they're currently working on a new album). All in all, it was a very enjoyable night! Many thanks to the guys for sparing some time to chat and drink beer, and to my buddy Tom from Polymath PR for hooking me up! Woop, day two! That means two blogs in one day. Poor you. Anyway, I'm sure y'all know what the deal is. Thornbridge are, without a doubt, one of the best breweries in the UK. Again, it's a brewery that nails everything they do and I've been drinking their beers for as long as I remember. Sequoia is an American Amber Ale... it's a style that's not brewed so often over here, with many breweries favouring American IPAs or even Red Ales. I'm probably cheating a bit here as it's a beer I know and love already, but still. Looks: Dark Amber, slightly hazy (cask was fresh on & I don't mind a bit of haze) with a lovely fluffy white head. Aroma: On the nose you get chewy toffee sweets along with some pine and citrus fruit. Flavour: Citrus fruits leading into light toffee with a lovely marmalade covered digestive biscuit base. Mouthfeel: So smooth and velvety, an awesomely drinkable beer. Overall: Yup... it's the same as when I first had it at Norwich Beer Festival about 5 years ago... I still absolutely love it and can't avoid buying a pint when I see it! Right, that's it for today... I'm off to see Raging Speedhorn at The Waterfront tonight so I imagine I will be surviving on pints of Red Stripe. Wonderful. Just an idea I got, I'm gonna make sure I write something every day and to do that I figured I'd write about a beer I have each day leading up to Christmas. Obviously this is a day late but YOLO. That means you unlucky people get two blogs today. So this is a collaboration between the awesome Beavertown Brewery in London, Mikkeller in Denmark & Arizona Wilderness in the USA. I'm a massive fan of Beavertown as they seem to nail every style of beer they brew, and Mikkeller is legendary. I've never had anything from Arizona Wilderness because I'm pretty sure they don't export, but I've heard very good things. Look: As red as a cloudy summer sky, that is to say that it's pretty damn red but there's defintely a storm coming! Aroma: You get potent aroma of red berries, with a funky undertone.Yum. Flavour: A massive hit of sour cherries that slowly fades, making way for sweet raspberry jam and a bit of acidity. Mouthfeel: As dry as the deserts in Arizona, but also as sticky as leaving an ice lolly to melt on your car dashboard. Well, that's it for day one... Day two will come later.